Torrent downloader plays a very crucial role when it comes to downloading large files, such as movies, software, games etc. But the catch is, you just can’t download a torrent file using your casual downloader. It won’t work. You will need a separate torrent downloader or torrent client for that. So in this article, we are providing you with the list of 10 Best Torrent Clients or Torrent Downloader for Windows in 2018. But, before moving further we would like to acknowledge you about the two broad choices regarding torrent downloading tools. Both cloud and client services have their own set of advantages. Where cloud is better at cloaking your P2P habits, on the other hand, the client offers free of cost service. So it’s entirely up to you, what you choose. The first and the most preferred torrent downloader on our list is BitTorrent. Despite being too old it still holds a very great place and a strong user base. As the new versions came up, it now has more advanced useful features in it. For instance, it now organizes different downloaded torrent files based on their categories. And also provides more technical details on them as compared with other torrents. Not only that it also offers download scheduler, limit bandwidth usage, paired devices and many other features in BitTorrent’s Preferences windows. So, you can explore it by yourself. The best part is it’s absolutely free and has all the required features in it. But if you are allergic to advertisements and want more handy features on it, then you can opt for BitTorrent Pro which also supports customer support service now. And of course for the PRO version, you have to pay, so keep that in mind. If you ever used BitTorrent then using a uTorrent will be a piece of cake for you. It’s a very popular torrent downloader as people are using it since 2005. The reason it is called as the BitTorrent alternative is that it was developed by BitTorrent Inc itself. So it has the same UI and almost the same features in it. In short, they look very similar except the logo and theme color. And only these two things can tell the difference between both. Web Torrent is the easiest torrent downloader a user can have. If you are not into extra features or something then web Torrent is for you. Its simplicity can be defined by the fact that if you want to download a torrent file. The only thing you need to do is paste the torrent file URL in its main windows and you are done. It’s as simple as that. After 1 or 2 seconds, it will automatically start downloading that file. This torrent downloader came into existence in the year 2017. And still manages to give a tough competition to other well-established torrent downloaders such as BitTorrent and Utorrent. Another reason why people prefer web Torrent is that it runs directly inside the web browser, without the worry of downloading it separately. That gives it a complete edge over the others and makes it as the most loved torrent downloader over the internet. BitComet is not only a torrent downloader. It is also used to download other files as well. 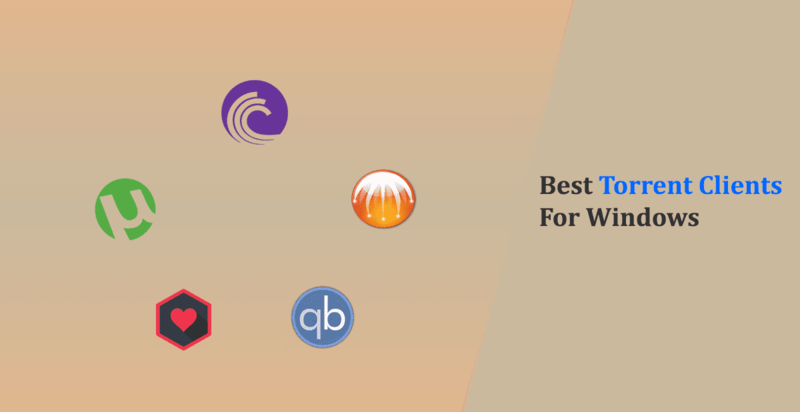 In fact, it is considered among the best download managers for windows mainly because of its best of both worlds capability. 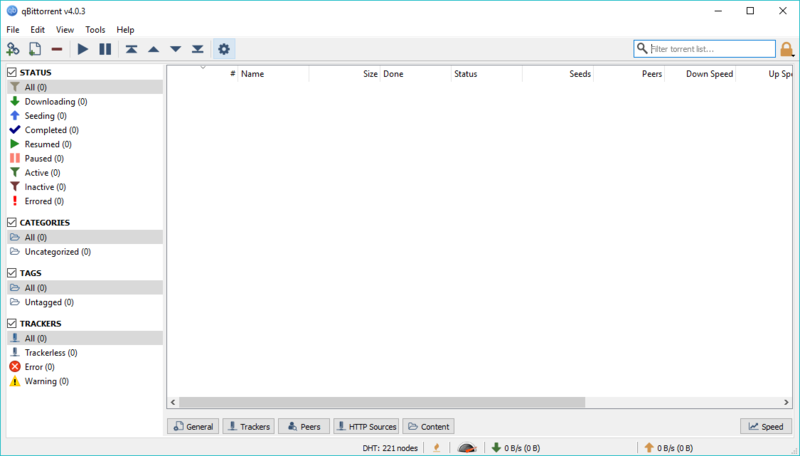 BitComet has all the features of normal and torrent downloader. And also has some additional features in it such as long-term seeding. This feature allows BitComet to fetch data from other peers who have 100% of that torrent file. This facility mainly helps when all the seeders go offline, and the torrent gets stuck. It also has the intelligent disk caching feature. This feature puts the frequently accessed data in the cache of main memory, allowing less use of a hard drive which somehow effects on the system’s performance. 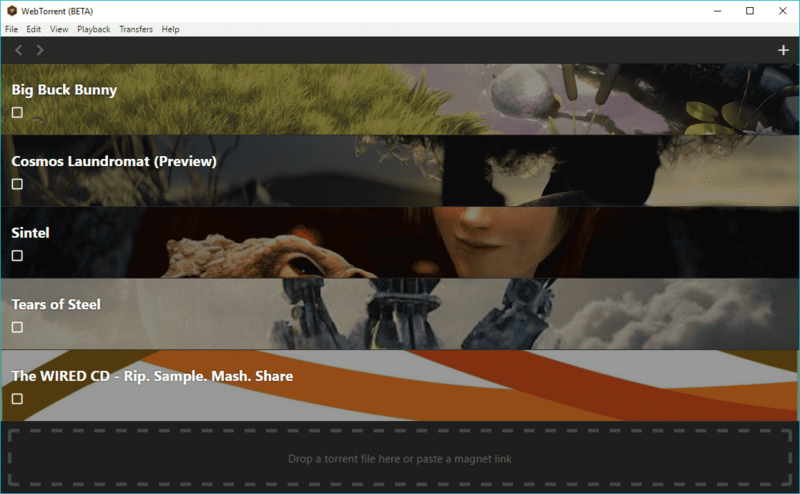 qBitTorrent is a free open source torrent downloader which has all the juice to serve. In simple words, it has all the main features that a torrent downloader posses. The best part about this torrent downloader is that it is absolutely free from any promotional ads or advertisements. Means you need not to worry about those irritating ads. Another feature we like about this torrent is that despite of having so many options regarding customization and all. It still manages to keep things simple, clear and in a sorted way. So the chances of getting confused while using it is almost zero percent. It also has its own search bar which let the users find downloaded or downloading torrent files. One more interesting feature you might like about this is its UI lock. You can activate this UI lock by clicking the yellow padlock in the top-right corner or you can set the UI password for qBitTorrent. Working on the principles of Tor like onion network, Tribler is the torrent downloader you would like to get your hands on. This unique feature adds on the point when it comes to downloading of the best torrent downloader a user can have. In order to make user anonymous, Tribler cuts their direct link from BitTorrent swarm by placing three daisy-chained proxy servers in between. However, this feature only works for peers or torrent downloaders. Proxy support for seeders is currently considered as an experimental feature. You can also change the anonymity settings by visiting Settings > Anonymity. Rest you can experience it by downloading it from the link above the picture. Vuze is an amazing torrent downloader when it comes to functionality and usage. It isn’t much younger than BitTorrent or Utorrent. But has all the necessary features in it. It comes with built-in web and metasearch tools, in order to keep users within the boundaries of the torrent. The best part about Vuze is that it has its own high-quality torrent files supported from official sources. 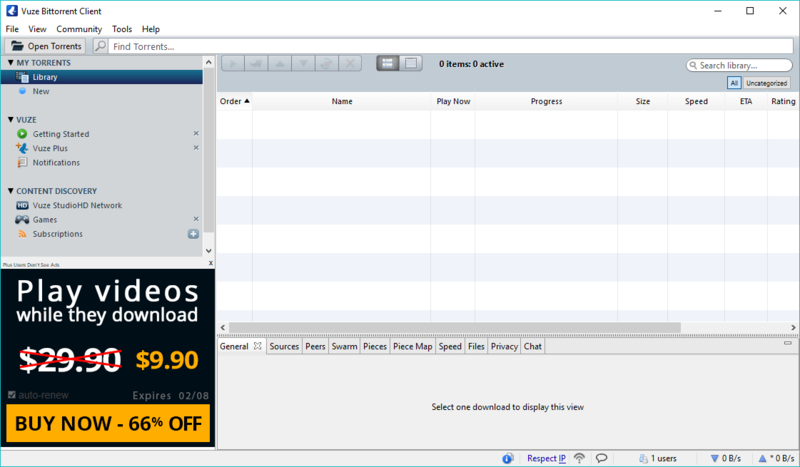 Vuze also allows users to chat with other Vuze users and share torrents. It can also convert and transfer files directly to different devices which is something unique about this torrent downloader. Moreover, the torrent also supports iTunes integration. At last, you may not find it as much eye appealing as Tribler but it owns much potential than others. It’s a well-built torrent downloader which is fully featured packed. So must give it a try. This offbeat torrent downloader might look a bit odd to some people. But never mistake to judge its capabilities by looks. 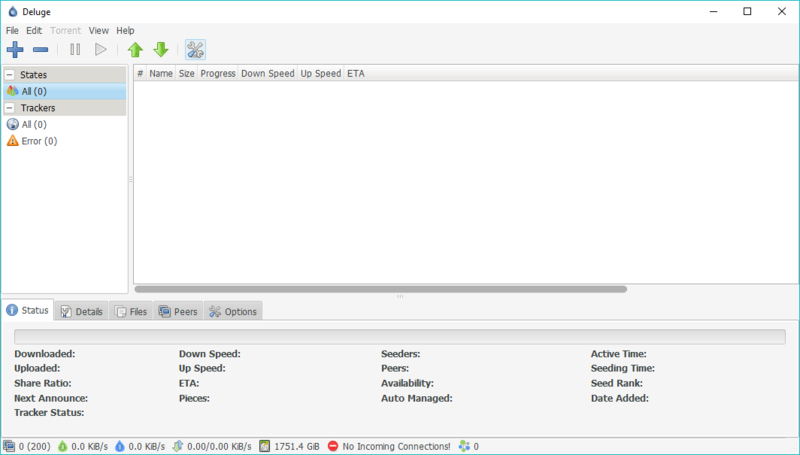 It’s a simple, lightweight torrent downloader that does its job pretty well when it comes in downloading torrent files. Deluge also has its own cross-platform presence by offering support for Linux and MacOs. It also offers features like encryption, local peer discovery (LSD), setting global and per-torrent bandwidth limits, etc. Also has the support for various first and third-party plugins for more personalized user experience. Bitport.io is an excellent torrent downloader which works on the cloud or as a cloud service. This simply means you need not to download any software or perform any kind of installation. Instead, you only have to log into your online account and they will download torrents for you onto their own private servers. Which is pretty nice. Once your file downloaded on their server then you can simply transfer it on your computer by signing in again. The free version allows enough of 1 GB of storage. But you can subscribe it, to get more storage and unlimited transfer speeds. Similar like bitport.io, Boxopus is a cloud-based torrent downloader service you will enjoy. Boxopus has the capability of storing your torrent files in your own Google Drive or Box accounts which is absolutely amazing. The sad part is its not a free service. They will charge you around $1.50 per week, $14.50 per month, and $50 per year which is according to us is very reasonable if you somehow manage to plan your downloads first. Rest you can opt for any of the options above. So this was all regarding 10 Best Torrent Clients or Torrent Downloader for Windows. If you have any better suggestions then let us know in the comment section below.